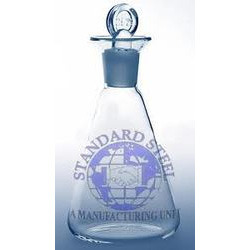 Our valuable clients can avail from us a premium quality range of Erlenmeyer Flask. With the constant support of our dexterous crew of technocrats, we are fulfilling the varied requirements of clients by manufacturing and supplying optimum quality Volumetric Flask. We manufacture Conical Flask Erlenmeyer. Capacity from 25 ml to 2000ml with socket. We are engaged in offering good quality Quartz Erlenmeyer to our valuable clients at very reasonable price. Manufactured from ASTM E 438 TYPE A BORO 3.3 Glass. These flasks comply to DIN ISO 1773 and USP standards. All these flasks come with thick reinforced rim and are manufactured from glass. These flasks come with white graduation and marking area for use with ordinary pencil. 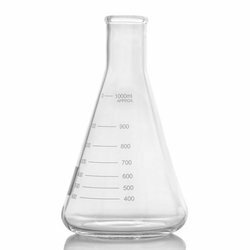 02.298 Flasks Erlenmeyer, “LABOGLASS, Conical, Wide Mouth, Approx. graduation.